Don't miss out a great offer from Aéropostale which is on right now! Spend more money save more money. It is very easy: use your own printable coupon which allows you to take $10 off purchase of $50 or more, to take $15 off purchase of $75 or more, to take $25 off purchase of $100 or more. 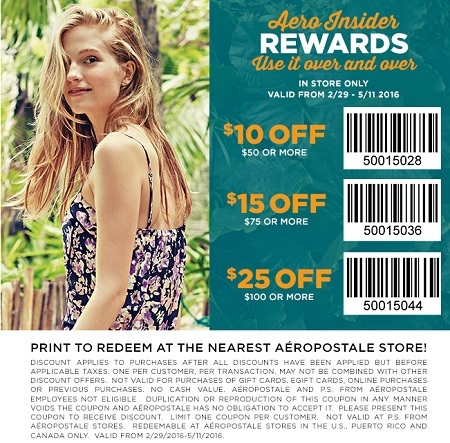 You can get your own printable coupon through Aéropostale emailing. Source of the information is Aéropostale. Offer is valid through May 11, 2016. For more details visit your nearest Aéropostale store location or official website.